Print, halftone photograph, Wharton Hall, Wharton, Westmorland, published for the Cumberland and Westmorland Antiquarian and Archaeological Society, by Titus Wilson, Kendal, Westmorland, and by Charles Thurnam and Sons, Carlisle, Cumberland, 1892. Tipped in opposite p.165 of The Old Manorial Halls of Cumberland and Westmorland, by Michael Waistell Taylor. Print, plan of Wharton Hall, Wharton, Westmorland, published for the Cumberland and Westmorland Antiquarian and Archaeological Society, by Titus Wilson, Kendal, Westmorland, and by Charles Thurnam and Sons, Carlisle, Cumberland, 1892. Tipped in opposite p.168 of The Old Manorial Halls of Cumberland and Westmorland, by Michael Waistell Taylor. Photograph, black and white, Wharton Hall, Wharton, Westmorland, by Herbert Bell, photographer, Ambleside, Westmorland, 1890s. Photograph, Wharton Hall, The Old Tower and Gallery, Wharton, Westmorland, by Herbert Bell, photographer, Ambleside, Westmorland, 1894. Vol.1 no.35 in an album, Examples of Early Domestic and Military Architecture in Westmorland, assembled 1910. 35. Wharton Hall, The Old Tower and Gallery. Kirkby Stephen. E.
Photograph, Wharton Hall, The Gatehouse, Wharton, Westmorland, by Herbert Bell, photographer, Ambleside, Westmorland, 1897. Vol.1 no.36 in an album, Examples of Early Domestic and Military Architecture in Westmorland, assembled 1910. 36. Wharton Hall, The Gatehouse. Kirkby Stephen. E.
Photograph, Wharton Hall, Gateway, Wharton, Westmorland, by Herbert Bell, photographer, Ambleside, Westmorland, 1897. Vol.1 no.37 in an album, Examples of Early Domestic and Military Architecture in Westmorland, assembled 1910. 37. Wharton Hall, Gateway. Kirkby Stephen. E.
Photograph, Wharton Hall, The Gatehouse from the Courtyard, Wharton, Westmorland, by Herbert Bell, photographer, Ambleside, Westmorland, 1897. Vol.1 no.38 in an album, Examples of Early Domestic and Military Architecture in Westmorland, assembled 1910. 38. Wharton Hall, The Gatehouse from the Courtyard. Kirkby Stephen. E.
Photograph, Wharton Hall, The Tower, Wharton, Westmorland, by Herbert Bell, photographer, Ambleside, Westmorland, 1894. Vol.1 no.39 in an album, Examples of Early Domestic and Military Architecture in Westmorland, assembled 1910. 39. Wharton Hall, The Tower. Kirkby Stephen. E.
Photograph, Wharton Hall, Ruins of the Great Hall, Wharton, Westmorland, by Herbert Bell, photographer, Ambleside, Westmorland, 1894. Vol.1 no.40 in an album, Examples of Early Domestic and Military Architecture in Westmorland, assembled 1910. 40. Wharton Hall, Ruins of the Great Hall. Kirkby Stephen. E.
Photograph, Wharton Hall, The Kitchen, Wharton, Westmorland, by Herbert Bell, photographer, Ambleside, Westmorland, 1897. Vol.1 no.41 in an album, Examples of Early Domestic and Military Architecture in Westmorland, assembled 1910. 41. Wharton Hall, The Kitchen. Kirkby Stephen. E.
Near Kirkby Stephen, ... on r. Whareton Hall, Earl of Lonsdale. 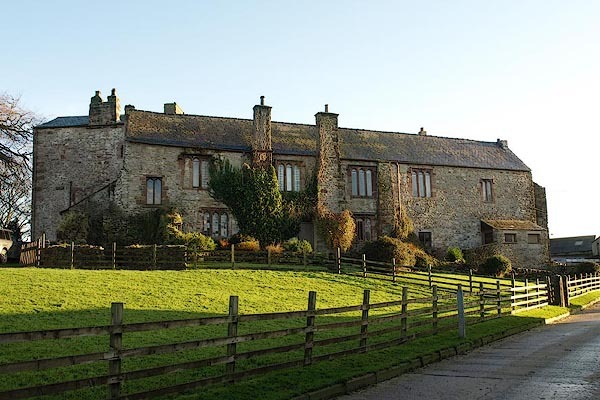 Wharton house has been the seat of its family from the reign of Edward I.; and they have been lords of Croglin hall in Cumberland, and patrons of that rectory above 400 years. Thomas was created a baron by Henry VIII. for his surprising conduct and success in the entire defeat of the Scots at Solom moss; which victory in all its circumstances was perhaps one of the most considerable the English ever gained over the forces of the neighbouring kingdom. Edward VI. in recompence of that eminent service granted this lord an augmentation of his paternal coat, a border engrailed O. charged with legs of lions in saltire G. armed Az.. He died 1568, and was buried in the church of Kirkby Stephen, where is a monument to him and his two wives. He was succeeded by his son Thomas, who died 1572, had for successor his son Philip, who dying 1625, and was succeeded by his grandson Philip, son of sir Thomas, who died in his father's life-time. Philip died and was succeeded by his son Thomas, who was advanced to the honour of viscount Winchedon and earl of Wharton, and afterwards marquis of Wharton, and died 1715. His only son and successor was created duke of Wharton, and died 1731. The village of Wharton was demolished long ago to make room for the park, and the hall is now desolate and in ruins. Circle, in its park - ring of fence palings, trees. Buildings and tower in a ring of fence palings with trees. Tower, symbol for a house, hall, tower, etc. Park with fence palings and a tree, and the hall. Print, engraving, Wharton Hall, Wharton, Westmorland, drawn by Moses Griffith, engraved by S Sparrow, published by Edward Harding, 98 Pall Mall, London, 1801. Tipped in opposite p.129 of A Tour from Downing to Alston Moor, 1773, by Thomas Pennant. Moses Griffith. Del. / S. Sparrow. Sc. / WHARTON HALL / Pub June 1 1801 by Edw Harding 98 Pall Mall. Print, halftone photograph, Courtyard, Wharton Hall, Wharton, Westmorland, published by J W Braithwaite and Sons, Kirkby Stephen, Westmorland, 1922. Tipped in opposite p.32 of a guide book, Kirkby Stephen, 4th edn 1922. THE COURTYARD, WHARTON HALL, KIRKBY STEPHEN. hearsay Built by Hugh de Querton, 15th century. 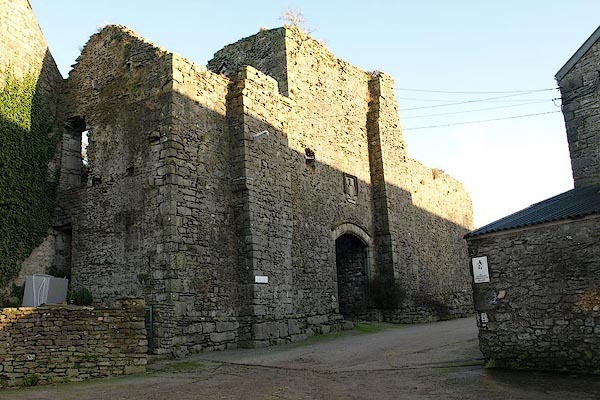 It is now a private farmhouse, fortified, with a gatehouse and courtyard. A later owner, Thomas Wharton, made a deer park, 1560, enclosing land from here to Ravenstonedale. Tenant farmers were turned out, the old village of Wharton abandonded, a nine foot high wall built to keep deer in, and people out.